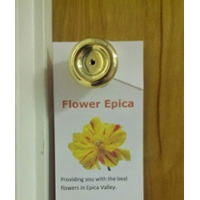 › DIY Printing Tips › Door Hangers › Do you have a template for DH3UP-CIR-B-SU door hangers? Do you have a template for DH3UP-CIR-B-SU door hangers? Q: I just received the order of the DH3UP-CIR-B-SU door hangers. I have Microsoft 2003 Word and Publisher. I cannot find the appropriate downloadable template for this style. A: You may download our Microsoft Word template for the 3UP Door Hangers.